And then a breakdown that has become too familiar for the Flyers: Blowing a two-goal lead in the third period to Ottawa in front of a fed-up crowd. “Everything we touch, it just doesn’t work,” Flyers forward Jake Voracek said. Brady Tkachuk had the magic tough for the Senators. Tkachuk scored twice in the third period and Matt Duchene scored the eventual winner with 2:59 left, lifting the Senators to a 4-3 win over Philadelphia on Tuesday night in the Flyers’ first game since Hextall was fired. The Flyers showed why Hextall is out of work and Hakstol’s job is in jeopardy. They coughed up a 3-1 lead over the final 6 ½ minutes of the third period and lost for the sixth time in seven games. “As soon as they got that second goal we kind of got scared. 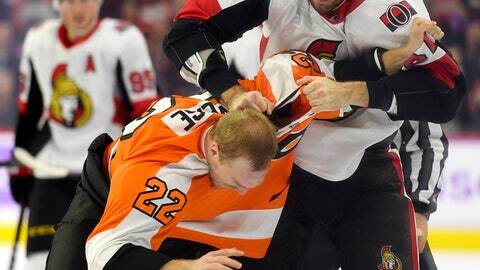 You can’t do that,” Voracek said. Tkachuk made it 3-2 late in the third and he tied it on a tip-in with 6:31 remaining. The Flyers turned it over in their end and Duchene batted the puck past Anthony Stolarz for a 4-3 lead. “It felt like it was the only time I touched the puck all night,” Duchene said. Voracek, Radko Gudas and Travis Konecny scored for the Flyers in front of scores of empty seats inside a home arena once among the most imposing in the NHL. Flyers fans have turned away in droves and tickets were selling on the secondary market for $6 in the mezzanine level, a minor-league price for a franchise that traditionally averaged 19,000 fans a game. Hakstol knows he’s in a precarious position with Hextall, who hired the coach with no NHL experience out of North Dakota in 2015, gone. Flyers President Paul Holmgren said the next general manager would decide Hakstol’s fate. Hakstol, in his fourth season, has led the Flyers to pair of playoff berths and his job appeared to be on the line after the Flyers lost 6-0 to Toronto on Saturday. Instead, it was Hextall who was fired with the Flyers (11-11-2) mired in mediocrity and fighting for a playoff spot in the Eastern Conference. But it was more than the sagging record that sent Hextall packing; Holmgren said the former GM was “unyielding” in his philosophical approach of building the Flyers into winners through the draft and a lone-wolf style of management. Hextall had tuned out input from other decision makers in the organization and had yet to make a big splash with the type of trade that could transform the Flyers into instant contenders. Holmgren said the Flyers would like to hire a new GM within weeks. They need a win sooner than that. Konecny scored his seventh goal of the season just 4:23 in the game for the usually slow-starting Flyers. “I think the main thing for us is getting in the offensive zone and even if it’s not your ‘A’ game, as long as we’re cycling the puck and doing the right things down low then we are going to get opportunities,” Konecny said. Thomas Chabot beat Stolarz in the first to even the score 1-all. Stolarz was the whopping fifth goalie to start a game for the Flyers this season. Voracek scored his sixth goal of the season in the second period and Gudas followed with his first for a 3-1 lead to cushion the lead. Much like Hextall during his tenure, it wasn’t enough. Tkachuk, the fourth overall pick of the 2018 draft, scored his eighth and ninth goals of the season to spark a comeback. NOTES: The Senators snapped a four-game losing streak. … Ottawa completed its third set of back-to-back games and improved to 1-1-1 in the second game. Senators: Host the Rangers on Thursday. Flyers: At Pittsburgh on Saturday.